This is our classic book on JCL (Job Control Language) for the OS operating system on IBM mainframes. 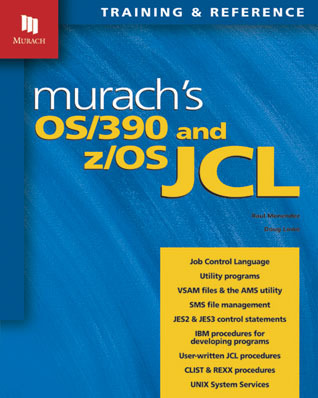 Since the first edition was published in 1980, more than 200,000 mainframe programmers have learned JCL from it. And those JCL skills are still relevant today. In fact, although this book was published in 2002, it still presents the core JCL skills that you need for getting a job in a mainframe shop today. But this is far more than a JCL book. Besides JCL, it does a great job of introducing the IBM mainframe environment, which is so foreign to anyone who has been working on another platform. That includes VSAM data management and Access Method Services, OS utility programs, the sort/merge utility, TSO, CLIST, REXX, and Unix System Services. Since the 1960s, the OS operating system in its various releases has been used to run IBM mainframes, the powerful computers that handle thousands of transactions every day in large companies throughout the world. This book was written for the current edition of OS, z/OS, and its immediate predecessor, OS/390. But because IBM software is upward-compatible, everything in this book should work on subsequent releases as well. The intent of this book is to teach you JCL. If you’re completely new to it, this book will start you from the beginning. But if you already have some JCL skills, this book will raise you to a new level of mastery. Along the way, you’ll learn how to use many of the facilities of z/OS and OS/390, including ISPF, Access Method Services, utility programs, the sort/merge utility, TSO, CLIST, REXX, and Unix System Services. When you finish this book, you’ll have a rich view of what the operating system can do, and you’ll know how to take advantage of those capabilities on the job. Find out what’s going on in the IBM mainframe environment so you’ll know how the JCL you code affects the system’s processing. You’ll see how OS/390 and z/OS build on earlier operating systems, and why the JCL you learn today will work for many years to come. Learn how to code the JCL you’ll use every day on the job to run programs that process disk, tape, and print files. You’ll also learn how to create and use stored procedures, which can save you dozens of lines of JCL coding. Learn the time-saving JCL features that you’ll use regularly, but not every day. That includes error handling techniques, generation data groups (GDGs), and SMS (the Storage Management Subsystem that takes care of many file-handling tasks automatically). See how easy it is to code the JCL for jobs that use VSAM files. Then, learn how to use AMS (the VSAM utility) to create and manage VSAM files, including how to create alternate indexes for key-sequenced data sets. Learn how to use some of the work-saving tools that OS/390 and z/OS provide for program development, including: compilation procedures; utilities for jobs like sorting and copying files; procedure building tools like CLIST and REXX; and Unix System Services, a facility that lets you access files designed for Unix systems. If you’re a programmer trainee, this book represents the fastest and best way to get started with z/OS or OS/390 JCL. By the time you complete the first nine chapters of the book, you’ll have most of the knowledge and skills that you need for programming. Then, you can build on those skills whenever you need to. If you’re an experienced programmer, this book will help you enhance your JCL skills whenever you need to. If, for example, you need to work with generation data groups, chapter 12 shows you how. If you want to generate a test file by using the IEBDG utility, chapter 18 shows you how. And if you are called upon to work with Unix files on your mainframe, chapter 21 shows you how. If you’re an operator or an operator trainee, we don’t know of a better way to get the JCL training that you need than using this book. Of course, there’s more to being an operator than knowing JCL. But this book will give you the JCL background that every operator needs, and it will be the first reference that you turn to when JCL problems arise. If you’re new to IBM mainframes, the three chapters in section 1 introduce you to mainframes, the operating system, and ISPF. This is the introduction that every new mainframer needs because no other platform is like a mainframe. If you’re new to JCL, chapter 4 teaches you a subset of JCL that will get you started right. Then, you can build on that subset in the five chapters that complete section 2. When you finish this section, you’ll have better JCL skills than most professional programmers. After you complete the first two sections of this book, you can read sections 3, 4, and 5 in whatever sequence you prefer. You can also read the chapters in sections 3 and 5 in whatever sequence you prefer. That’s because these sections and chapters are designed as independent modules. We refer to this as “modular organization,” and it lets you get the training you need, when you need it. Throughout the book, hundreds of examples show you the right way to code JCL for specific operations. Whether you’re a beginner or a professional, these examples clarify the critical decisions that you have to make and help you avoid the errors that cause your jobs to fail. Besides showing you how to code the JCL for an operation, this book gives you the background that you need for knowing why you should code it that way. That gives you a measure of confidence and competence that many mainframers lack. After you use this book for training, the examples, paired pages, and modular organization make this book the best on-the-job reference you’ll ever use. Chapter 3 of this book gets you started using ISPF, IBM’s standard platform for application development under OS/390 and z/OS. With that start, you’re ready for MVS TSO, Part 1: Concepts and ISPF, which will teach you how to use all the ISPF facilities you need for program-development tasks. Learn how to write interactive COBOL programs using IBM’s world-class transaction processor, CICS. Learn how to write COBOL programs that process DB2 databases using SQL. 2 books in 1! A fast-paced training guide for COBOL beginners and entry-level programmers…an indispensable, on-the-job reference for anyone who works with COBOL. This chapter teaches you how to use IBM's procedure facility. With this facility, you can code just a few JCL statements to execute procedures that contain dozens or even hundreds of JCL statements. By the end of this chapter, you'll be able to execute existing procedures and create new procedures of your own, including those with symbolic variables. And you'll see why so many IBMers keep a copy of this book within easy reach as their first choice for training and reference. This download unzips into a 66-page Word document that contains the JCL coding segments and job streams that are used as examples in the book. That way, you can copy them and use them in your own code. On this page, we’ll be posting answers to the questions that come up most often about this book. So if you have any questions that you haven’t found answered here at our site, please email us. Thanks!